STATE STUDY  Manufacturing boosts economy but low-wage casino jobs drain taxpayers and expand govt. blames Dems for nuke dump. BUILDING THE FUTURE (Clockwise from top left) --- Laborers and Operating Engineers repave the parking lot of the Committee to Aid Abused Women. William Kolsch of Bricklayers Local 1 builds the central kiosk at Victorian Square in Sparks. A journeyman plumber from UA Local 350 immersed in his work at Sparks Marina Park. Ironworkers from Local 118 raising the high iron at the Reno Peppermill Hotel-Casino expansion. Trade unionists from Laborers' Union Local 169 conduct informational picketing at Baldini's Sports Casino in Sparks. Apprentices from Painters & Allied Trades Local 567 renovate the historic Lake Mansion next to the Reno-Sparks Convention Center. Center: An electrician from IBEW 401 clocking in at Victorian Square. a mile away; citizens livid. "The union members attending the national AFL-CIO convention at Paris Las Vegas last week opened their wallets to contribute to the Displaced Workers Fund, which helps Las Vegas workers laid off since Sept. 11. Union officials said more than $100,000 was raised. 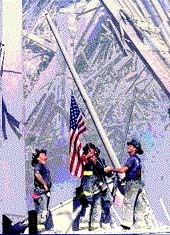 Old Glory's red stripes have always represented the blood of America's patriots. and we'll e-mail it to you in pdf format. RENO, NV (July 6, 5:24:05 p.m. PDT)  Reno attorney Jeffrey Dickerson filed a six-count claim and jury trial demand in U.S. District Court. For details, analysis and links to similar cases, see Barbwire by Barbano in the Daily Sparks (Nev.) Tribune. For regional and national fallout, the Jespersen case home page and archive, click here. Legal beagles and labor bulldogs may also read the complete text of the federal civil rights filing. AB 661, the bill to deregulate large power users such as mines and casinos, was the last measure passed by the Nevada State Senate at three minutes before 12M PDT on June 4. It will skyrocket small consumer rates. The laudable opposition: Sen. Joe Neal, D-North Las Vegas, and Las Vegas Sens. Ann O'Connell (R), William O'Donnell (R), Dina Titus (D) and Valerie Wiener (D). It cleared the lower house after the constitutional adjournment deadline. A special remedial session called by the guv failed to resolve matters. For updates, watch the Energy Crisis War Room and the Barbwire. Las Vegas CityLife  Can Nevada Latinos spark a progressive movement in a retro state where the Sixties never happened? to stay, offers CC Fairgrounds and pristine Fuji Park properties. SIT ON THIS  Mirage cocktail waitresses win round in federal court against Steve Wynn, who called them "fat asses"
Site content © 1982-2004, Andrew Barbano. Stricken Sparks 5-year-old meets Britney Spears in Las Vegas, then quietly passes away. This Union Ring site is owned by Andrew Barbano. Comments and suggestions appreciated. Sign up for our breaking news and bulletins list.